Don't show up at Etzel field today to watch the Pilots play the Cal State Northridge Matadors. All three games this weekend are now scheduled to be played at Concordia on their turf field! Game time today is set for 11am (weather permitting). So, our new field will be grass, down by the river; I’m guessing the engineers have it all figured out. BTW, it's Spring Break, why aren't the Pilots somewhere sunny?? Just asking? Yes, a great series win this weekend for the Pilots. Only 3 WCC contests remaining - next weekend at Gonzaga. There will be at least one more home game this season as the Pilots take on Oregon in a home/home series starting May 22nd at Pilot Stadium and finishing May 23rd at PK Park. Geez is right about hoping for the EPA to get its act together on the new River Campus. We're much closer to having the final go-ahead to begin moving dirt than we were 4-6 weeks ago. UP cleared the mandatory 30-day public comment period on the proposed clean-up plan without any comments and expect to have EPA's final order in hand by early June. Please note that Joe Etzel Field will be home for the Pilots for at least the 2013 season. Work on the new baseball facility on the River Campus will begin in late 2012/early 2013. The anticipated ground-breaking for the new Recreation & Wellness center on the current Joe Etzel Field site will be summer 2013. The Pilots should be able to play Fall ball 2013 at their new ballfield down by the River and all games thereafter in what will be an awesome setting. GO PILOTS! I throw this in this forum since there was talk about the new stadium a LONG TIME AGO. There was an announcement on the portal a few days ago that they were beginning work on clean up down on the river campus. One step in the right direction for the whole university! RipCityPilot wrote: I throw this in this forum since there was talk about the new stadium a LONG TIME AGO. The last stated estimate for beginning "moving dirt" I saw was September, 2012..............I hope the dirt AND debris HAS begone to move. I wonder though, if that include the the estimated $55 million cleanup of the former McCormick & Baxter creosote factory next to the UP parcel of land. I'm betting Shadrach can give us an update!! Up doesn't own the creosote property yet. It's the land downstream of where the barge is in your picture. The baseball park goes on the spit of land where the barge is. Well I sure don't want to disappoint DD so here's a bit of an update on UP's river campus. Yes indeed, work is now underway along the shoreline and a few upland areas. The contractor arrived on site August 15th and to date has moved in excess of 8,000 cy (cubic yards) of soil and debris from the shoreline. Large items are removed and stockpiled nearby for recycling and/or crushing later. The remaining soil is segregated through a 4" screener for relocation to the new baseball field area for use as a sub-base for the artificial turf to be installed. The project scope includes re-grading the shoreline to a 5.5:1 slope; planting native shrubs & trees along the shoreline to enhance fish habitat and provide riparian restoration; removal & transport off-site of contaminated soils; re-locating about 35,000 cy of soil to the ballfield footprint; disconnecting the 3 existing docks from the bank; and capping a 3.5 acre area with clean soil and/or 2" of asphalt. All told about 100 days of work to complete. We ask all interested parties to resist the urge to travel down to the site but instead satisfy your need "to take a look" by untilizing one or all of the 3 good viewing locations on the bluff. Check out the work below from the patio deck on the west side of Corrado Hall; from the view triangle at the intersection of Portsmouth & McCosh; and from the SLUG Garden viewpoint at the intersection of N. Warren & McKenna. This location has the best view of the work on the new baseball area. The clean-up and removal work is being done on the river campus only. The McCormick & Baxter site remains tantalizingly close but out of UP's reach as of today. But we remain interested in the property and have included it within the new master plan boundary submitted this summer to the City for approval. Stay tuned PN! Wonderful update, Shadrach, I knew we could count on you! As far resisting the urge of traveling down to the site; how else will we former students be able to retrieve all the beer bottles we've deposited there over the years? Actually, I'm going to wait until Opening Day for my next visit! Can't wait to PLAY BALL in the new ball park. Thanks for the update, Shadrach! This is such an exciting project--not just the stadium portion. I am going to seperate this thread off and re-title this portion, to help folks find this great information. Shardrach--you mentioned artificial turf; I believe the other most recent info was that it would have to be natural grass due to flood plain concerns. Has there been a change? The River Campus is an exciting project - all 35 acres! The past 2 really soggy spring weather conditions forced the coaches and baseball pros at UP to reconsider grass vs. artificial turf and they finally chose the latter. Good point about the 100-year flood plain which has been a concern from the beginning. To solve it for the baseball stadium footprint the reclaimed soil from the shoreline is being moved into that area with the intent of raising the entire area out of the floodplain. That calls for the relocation of about 35,000 cy of soil which is what be believe the final excavation and screening will yield. The top 1-2 feet of the new playing field will be imported materials essential for successful laying of the artificial surface. By raising the field level above the floodplain the turf mfgr. included the standard warranty which was otherwise unavailable if the surface was installed below the floodplain. Smart thinking I'd say. Shadrach wrote: The River Campus is an exciting project - all 35 acres! The past 2 really soggy spring weather conditions forced the coaches and baseball pros at UP to reconsider grass vs. artificial turf and they finally chose the latter. Terrific decision, I'd say. It is nice to see the professionals offering solutions for the long term. If we can be consistent in that regard, it will do nothing but advance the athletic programs. So, where does the timeline for all of this stand now? Can you ballpark a range of years yet (pun intended)? The EPA ordered clean-up and removal action should be completed by the end of November. The shoreline work is the highest priority as we want to take advantge of low river levels during August-October. This run of good weather has been great - lots of progress everyday. Work on the upland areas will be finished last - after all work on the shoreline is complete. The soil being moved to the baseball stadium footprint should all be in place by the end of November. Moving the soil, compacting it, and then grading it to the level requested by the stadium architects will take up most of that time. As mentioned earlier the final 1-2 feet of elevation will be added by the stadium team using imported soil & materials suitable to ensure a solid and compact sub-base prior to laying the artificial turf. When finished the entire playing field and permanent structures for the stadium will be above the 100-year flood plain. Most UP projects are dependent on fund raising and the baseball stadium is no exception. Ideally the new playing field will be complete by late summer 2013. If that happens the Pilots could use it for 2013 Fall ball. In addition to the field being ready the working plan calls for lighting, batting/pitching practice facility, temporary seating, dugouts, parking, etc. in Phase 1 with permanent seating and other stadium amenities coming later in Phase 2. This plan is still a work-in-progress and could change as time and fund raising results unfold over the next 9-12 months. The 2013 spring baseball season could be the last one at the current Joe Etzel Field but that is not the final word at this time. Lots of things still need to fall into place before ground-breaking for a new recreation & wellness center on the current baseball field site actually happens. Other non-baseball related work on the river campus may include development of a grass practice field suitable for soccer, lacross, and intra-mural activities; paved parking areas for everyday and event use; and a storage facility for physical plant vehicles and equipment. Work on upgrading the N. Van Houten access road as well as installation of an at-grade crossing at the railroad tracks are also in the mix of things to come. Stay tuned Pilot Nation for more good things to come from the River Campus. Thank you! This is great information, and the timeline for the new baseball stadium is very exciting! Not to step on Shadrach's toes (he knows more about this than anyone in the whole entire world, and that's the truth! ), but I'll throw in a bit of extra info. Though activity is finally happening on the River Campus, which is terrific and the result of many years of hard work, the University's primary fundraising focus remains a new Recreation and Wellness Center (i.e. the new Howard Hall). A lot of money has already been raised for that project, but more is still needed before groundbreaking can begin. Stonehouse wrote: Definitely very exciting! .........the University's primary fundraising focus remains a new Recreation and Wellness Center (i.e. the new Howard Hall). A lot of money has already been raised for that project, but more is still needed before groundbreaking can begin. Good job Stoney! Keep us focused; one donation to UP at a time! Just found out at the alumni game. the field will be ready in the fall of 2014 for the 2015 season. "With the generosity of benefactors........"
There's also a nice article in the Catholic Sentinel today, discussing the campus expansion, and prominently featuring Stonehouse pere. No link, since I don't see it on-line yet. 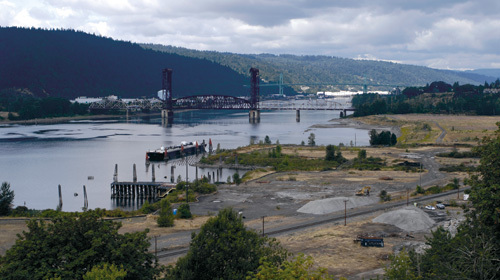 Though it’s commendable to restore the waterfront, it would be nice if the University of Portland’s care for creation could extend a few feet to the east to cover the Willamette Bluff, an important North Portland ecosystem that the university hopes to sacrifice to parking in order to preserve the upper campus’ spacious appearance. Instead, the university should consider joining with neighboring community groups, Friends of Overlook Bluff and Friends of Baltimore Woods, in restoring Bluff connectivity and native oak habitat. Honestly, some of tose folks are unbelievable whiners. The university always made it known they wanted the property for future expansion and ball fields, while the city and the community associations is absolutely nothing to make any kind of greenway development steps for thirty years. The city could have bought the property - even had it listed as a city park on the maps, but didn't want the liability of the cleanup. The community associations also did nothin..
Now they talk about it as a potential East side Forrest Park , a riverine treasure, and a potential next Springwater corridor. What they really had was a superfund site, a pile of old dangerous buildings, and an open air drug market. They had thirty years to clean the place up. They never did it. Now the University is stepping up to make the place an asset. more than half the land in the parking structure proposal will be be for habitat. That's more than UP had to do. The proposal is public record and does indeed include wilderness and tree plantings all over the bluff. I think they planted something like 10K seedlings in the cleanup. And the city agreed so in 2010 they approved the development of the parking structure. It's time for the whining to stop. Heck, if you did everything some of these neighborhood groups wanted Merlo would still not have any lights and neither would the turf field. Honestly, some of tose folks are unbelievable whiners. Whiners who clearly missed the "notice and comment" period for development and thus have nothing to do but, um, whine. PurplePrideTrumpet wrote: Heck, if you did everything some of these neighborhood groups wanted Merlo would still not have any lights and neither would the turf field. Um, just a guess, but I'm thinking some home owners on the Bluff are just plain tired of digging up old Blitz beer bottles left in their gardens from at least as far back as the mid-50's. There was no deposit on the bottles then, and we never even considered recycling. I'm sure the official word will filter down at some point, but it appears the River Campus Baseball Stadium project is OFF....bottom line, there are just not enough financial resources ($$$) to support it. ….the University's primary fundraising focus remains a new Recreation and Wellness Center (i.e. the new Howard Hall). A lot of money has already been raised for that project, but more is still needed before groundbreaking can begin. As I hear it, the plan is to continue the push for the R&W Center and to totally upgrade Etzel Field to include lighting and artificial turf to make it a very nice place to watch baseball in its current location. It would appear the 45 acre creosote land that Geez rightly pointed out is NOT owned by UP, and that will be cleaned up by the government, is being offered for sale at a rock-bottom price. If UP were to purchase the land it would than own 80 acres on the river that could one day, many years from now, be used for athletic fields, a recreational area and even a first class X-C site....some day! I’m sure some will be upset by this, but the decision makes excellent economic sense to me. There’s no way the baseball stadium could pay for itself through ticket revenue, and it would have been purpose built to serve only a few; whereas the Recreation and Wellness Center could affect everyone on campus. Does this mean I should sell the kayak I bought to shag balls in Etzel Cove?